For clothing, linen, curtains etc. We can supply high-quality export packing material. This versatile wrap combines bubble wrap and foam and is designed to offer extra protection to fragile pieces of furniture, large items with fragile surfaces. It will also protect your luggage and baggage from handling in transit. We can supply pallet-based containers for heavy, bulky and unusual sized items. Timber cases for international shipping can be made to measure. Want to know more? Read what our customers say about us. Get a quick quote now or contact our friendly world movers team on 0800 028 2556 or export.sales@alsworldmovers.co.uk. Alternatively, request a call back. London, Portsmouth, Birmingham, Manchester, Heathrow, Gatwick, Glasgow, Cardiff and Littlehampton. Hi Barbara & Andy just received these comments from Sicilly Thanks again. Mark The Antique House. ‘The shipment arrived safe and beautiful! The packaging was perfect. Thank you so much for having planned everything in such a manner’. I am happy to hear that Prem was able to deal with clearance and delivery in Doha so quickly. Yes he was a star. Thank you for helping me in these hectic few days. Thank you for helping me in these hectic few days. Lisa Rigg - Derby to Doha, Qatar. Yes thank you very much, goods have arrived safely. Thank you for the smooth service. Hi Andy Appreciate your help. All arrived OK and have given your number to some friends who may require your services. Jan.
Vicky Zgardzinski - Air freight - Scotland to Tortola, British Virgin Islands. Shipment arrived at my home in Houston yesterday. All boxes unpacked and the quality of the packing job was quite astounding. Thank you so much for all the effort you put into getting these thing here for us. Shipment arrived yesterday. All boxes unpacked and the quality of the packing job was quite astounding. Thank you so much for all the effort which was put into getting everything delivered to us here in Auckland safe and sound. Hugh Stratton, Auckland, New Zealand.Auckland, NZ. Just to let you know that I have received the packages yesterday. Many help for your help and support. 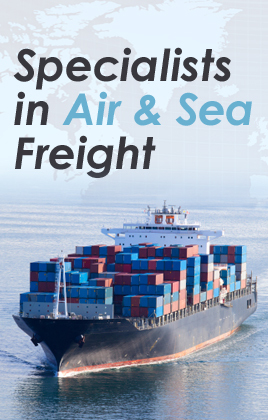 Air Freight from London to Doha, Qatar. Debit / Credit Cards , Bank to Bank Transfers , On Line Payment & Cheques. We specialise in handling International Removals, Excess Baggage, International Shipping and full Door to door relocations to the destinations below and many more!